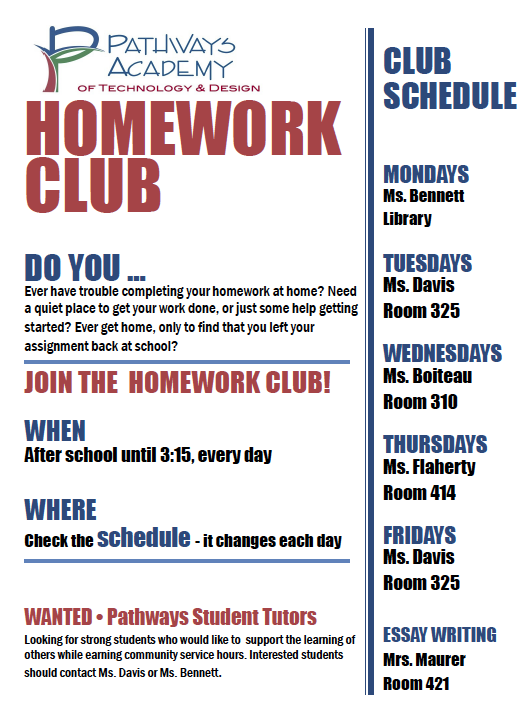 Join the Pathways Academy's Homework Club! Do you ever have trouble completing your homework at home? Need a quiet place to get your work done or just some help getting started? Join the homework club! The Homework Club meets every day until 3:15pm. Check the schedule for the classrooms available each day for homework club. We are also looking for students to provide peer support during homework club. Please see Ms. Bennett or Ms. Davis if you are interested in earning community service hours.